Sometimes finding the energy and the motivation to exercise is really difficult. After a long day full of work, the only thing we want to do is relax, watch television and eat. However, according to many scientific studies, exercise is a beneficial way to release stress and improve our mood and health at the same time. 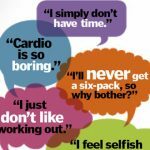 We just need to find motivation, a powerful reason that makes us get up and be ready for our workout. With these 4 suggestions, you will look forward to spending time at the gym. Put your gym headphones on and get lost in the unique world of music. Fitness audio combines entertainment with exercise. You can listen to your favorite songs while jogging, cycling or lifting weights, and your body can achieve better performances than without wearing the wireless gym headphones. Music during physical activity is an ideal company, helps you perform your best, and aids the flow of energy in your organism. You can run faster, heave more kilos and stay at the gym longer. That’s why fitness audio is the next best thing in workouts and gym headphones are the last word in fashion. If exercising alone is not your thing, then you should consider the option of having the company of a friend. 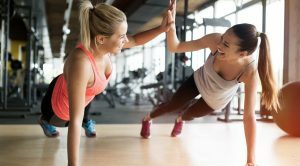 The more dedicated your friend is, the better motivation you will find to go to the gym. That is a perfect way to be socialized, stay in touch with people you had not enough time to see and make workout funnier and more interesting. You just have to choose friends, who can keep the same tempo with you so that everybody is satisfied. It is not a coincidence that in most gyms groups are offered so often. In a group team, you want to be your best self, and competition functions as an exercise boost. These programs usually combine music and fitness audio, so you don’t have to carry your gym headphones. Just feel free to follow what others do and be a vivid part of this big company. It is very likely that you will meet new people you admire and have a lot in common with. Open-air workouts, such as swimming, jogging and walking, can benefit your mental health and help you get away from the daily routine. These kinds of exercising are as expected the least boring, but some people can’t find a motivation even in them. If you don’t want the company of a friend or you couldn’t manage to find a friend ready to stand by you, why not choose the most loyal friend, your dog? 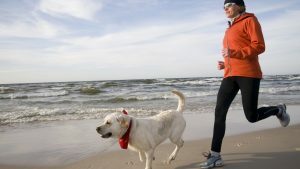 Dogs have a lot of energy, and exercising with them may be intense. Can you find a better way not to feel alone and do a fat-burning cardio activity with a happy company?